Blurb From Goodreads: Two years after his first visit, travel writer Brendan Shanahan returned to Turkey. After catching up with old friends in Istanbul, he set off on a journey in the country’s secretive east where, among other adventures, he found himself in the middle of a gunfight, was propositioned by a gang of teenage boys and swam to Armenia in his underpants. Returning to Istanbul, Brendan agreed to run a friend’s carpet shop. With only the dubious help of a loveable but wildly unstable drug addict, the results were occasionally disastrous, frequently hilarious and often poignant. Brendan Shanahan is a writer based in Sydney and Las Vegas. He writes regularly for various publications internationally and is the author of The Secret Life of the Gold Coast (2004), In Turkey I am Beautiful (2008) and Mr Snack and The Lady Water (2013). In Turkey I Am Beautiful was praised as ‘laugh out loud funny’ by the Sydney Morning Herald, named ‘one of the best travel books ever’ by the Sun Herald and listed in the year’s 10 best non-fiction works by ABC Radio National. Why Read: It was another pick from NetGalley, my new favorite website, and as I can’t stop (and won’t stop) reading travel books – it was almost inevitable that I was to read it! Although it took me a fair bit of time to get around to it, I’m so glad I waited and read the novel. 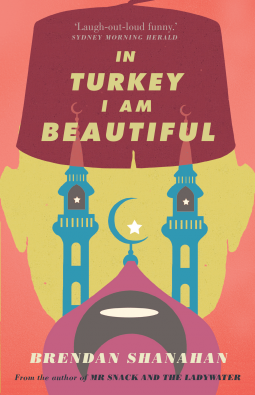 Review: In Turkey I Am Beautiful is one of those travelogues that makes you hesitate to travel to the mysterious eastern Turkey. Although Brendan spends quite a lot of his time in Istanbul, I felt like a majority of the book focused on looking at eastern Turkey and how perceptions are not always what they seem. From the friendly strangers, annoying children to the breathtaking moments of clarity, Brendan takes you along for the ride of a lifetime. Each of his friends have such distinct personalities that are undeniably foreign, which makes them more than the caricatures that other authors use. What makes the art of travel writing so difficult is stringing together a passage of time into something resembling plot, while cutting mercilessly things that no one would find interesting but yourself. While Brendan does unfortunately have some spots in the travelogue that are similar to this, such as his time in the carpet shop, in this particular book – it adds to the routine that he experiences in Turkey. I was in love from this book from the second I opened the first page. Turkey is a country that has interested me from a very young age, as it struggles to find a foothold between the Eastern and Western worlds. Brendan’s travelogue is just another great source that people looking to travel there should with vigor!